These holy and wonderful martyrs and heroes of the Christian Faith were at first noblemen at the court of Emperor Maximian. The emperor himself esteemed them greatly because of their courage, wisdom and fidelity. But when the emperor heard that his two noblemen were Christians, his love for them turned into rage. Once, when there was a great sacrificial offering to idols, the emperor demanded that Sergius and Bacchus offer sacrifices with him, but they openly refused to obey the emperor in this. Beside himself with rage, the emperor commanded that their military garments, rings and emblems be stripped from them and that they be dressed in women's clothing. He then placed iron hoops around their necks and paraded them through the streets of the city of Rome, to be mocked by everyone. Afterward, he sent them to Antiochus, his deputy in Asia, for torture. Antiochus had risen to his position with Sergius and Bacchus's help, as they had at one time recommended him to the emperor. When Antiochus implored them to deny Christ and save themselves from dishonorable suffering and death, these saints replied: ``Both honor and dishonor, both life and death-all are the same to him who seeks the Heavenly Kingdom.'' Antiochus cast Sergius into prison and ordered that Bacchus be tortured first. His minions took turns beating the holy Bacchus until his whole body was broken. Bacchus's holy soul departed his broken and bloodied body, and in the hands of angels was borne to the Lord. St. Bacchus suffered in the town of Barbalissos. 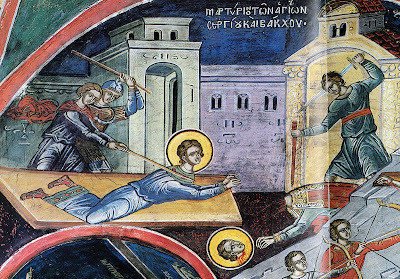 Then St. Sergius was led out and shod in iron shoes with inward-protruding nails. He was driven, on foot, to the town of Rozapha, in Syria, and was beheaded there with the sword. His soul went to Paradise where, together with his friend Bacchus, he received a crown of immortal glory from Christ, his King and Lord. 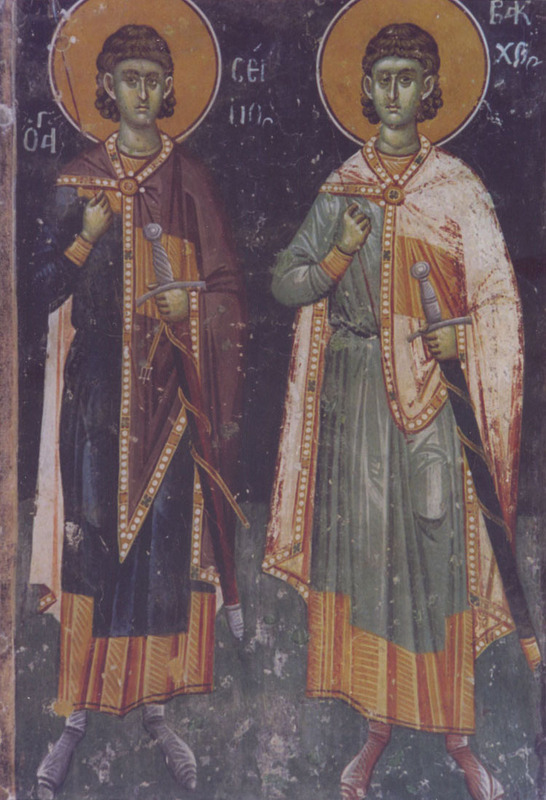 These two wondrous knights of the Christian Faith suffered in about the year 303." And another interesting site, Byzantium: 1200 is a project to recreate many of the incredible historic buildings in Constantinople via computer animation. See the following for more on the Church of Sts. Sergios and Bacchos: http://www.byzantium1200.com/sergio.html. 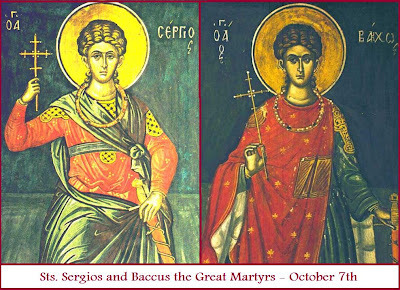 As we gather, let us crown with sacred hymns of laudation those two brethren in the Faith, the great and valorous martyrs: Sergius was the Triune Godhead's most steadfast warrior; and with him, wise Bacchus manfully suffered torments; and they both confessed Christ Saviour as God, the Maker and sacred Trainer of all. May Sts. Sergios and Baccus intercede for us all! No matter, what I write it seems that you don't understand. Please remove all content from Byzantium 1200, otherwise I will file a copyright imfringement to Google for your blog. I apologize if there is any infringement. I now link to your page so readers can go there themselves.